It’s understood the shell dates from the War of Independence era. 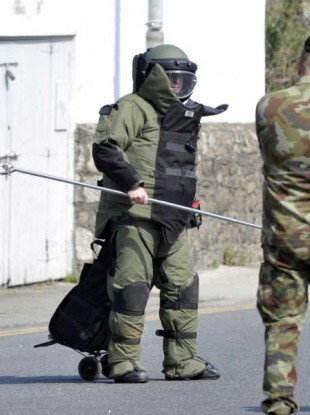 THE ARMY BOMB Disposal Team were called out to make a device safe in Limerick city this afternoon. The historical mortar shell was found by a member of the public on the banks of the Shannon. It’s understood the shell dates back to the War of Independence era. However – despite the age of the device and its poor condition – it still contained explosive material and posed a potential threat to the public. A team arrived on the scene at 2:25pm and gardaí cordoned off the immediate area near O’Callaghan’s Strand. It’s now being brought to a secure military area where it will be destroyed by a controlled explosion. Email “Old mortar shell that still contained explosive material found in Limerick city”. Feedback on “Old mortar shell that still contained explosive material found in Limerick city”.